I'm Johannes, a Communication Designer from Germany. While my work has been concentrated around Print Design and Illustration, I've recently also ventured into Interactive Design as well as 3D. I love exploring new ideas, techniques and mediums. The mobile site is under construction! Please visit my portfolio on desktop. In Korea, tattooing is illegal for people without medical training. However, most tattooists don't own such a license which is why the majority works illegally. Apart from legal prosecution they also still face social stereotypes that are based on negative associations with tattooed people. This magazine portrays the underground Korean tattoo culture through interviews with 7 tattooists. It came together as a self initiated project during my exchange studies in Seoul, South Korea. In South Korea, tattoos are still connected to a stigma by conservative circles of society. The country has a history of imposing exceptional amounts of cultural and social pressure on its youth which is evident through the fixation on constant comparison to peers and unrealistic beauty standards. The interviews showed, that the unregulated tattooing market in Korea has dynamics very different to western countries. There's no official health inspections even though most artists told us that this had been getting better over the last years. As tattooed people themselves, a lot of the artists had stories to tell about their struggles with family, relatives and friends accepting their choice. In some cases, contact has even been broken off. Holy Night Girl, seen here on the far right, had a unique perspective on female tattooists in Korea. Additionally to the legal problems they also face significantly lower pay rates. This is caused by the demand for female artists being lower, which could partially be the fault of the lack of respect for tattooing women in the scene. Some female artists can't even work fulltime and have to take up second jobs to survive on the tattoo market. The color scheme of the magazine is reduced two one signaling color and one contrasting but less bold one. 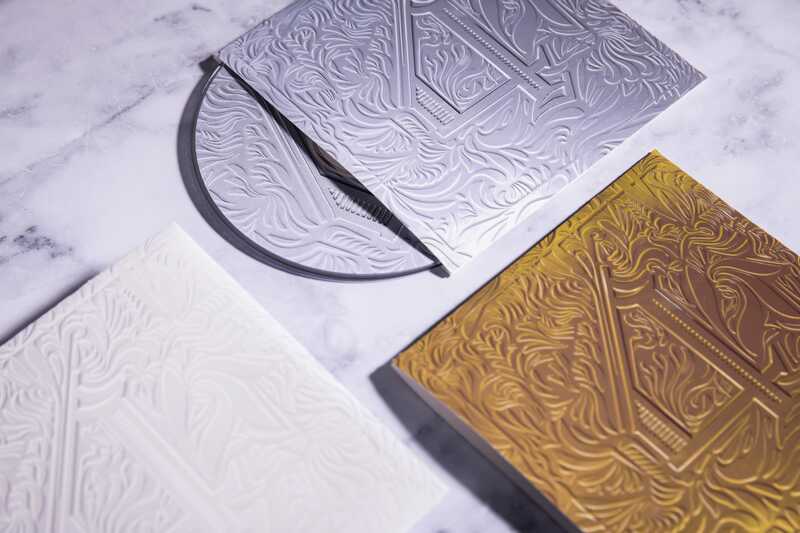 Each article has a tattoo equipment inspired lllustration that uses the same colors but adds a glow. This glow is translated to other parts of the magazine as well, for example the inside of each page spread. The font used was Uber Caps. There is some additional material that has not been implemented yet, but is planned to be added to the magazine as well. 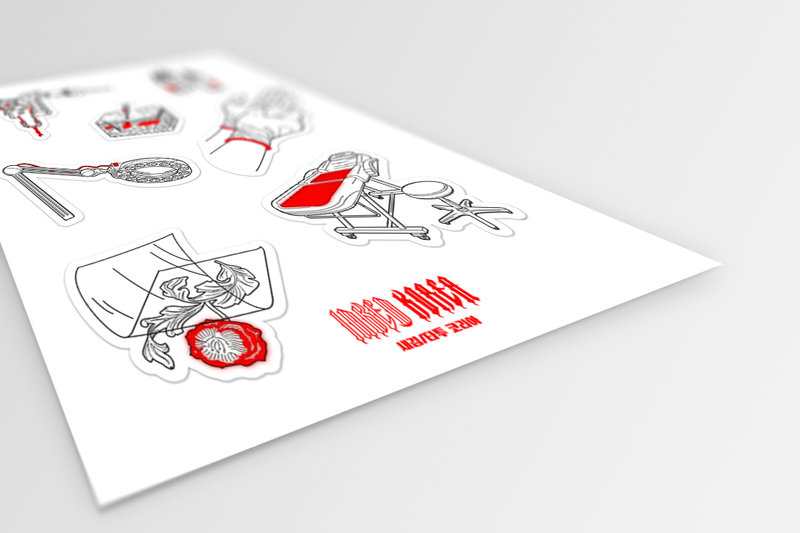 This includes a sticker set reusing the article Illustrations as well as an inlay folded poster to raise awareness for the issues Korean tattooists still face today. My graduation project focusses on social coworking in the Design space. 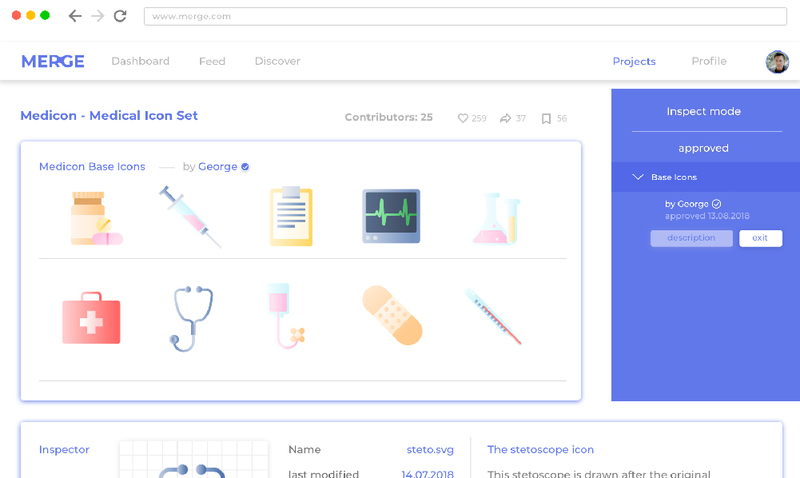 The platform merge aims to make collaborative work on Open Source projects possible for Designers and Design teams and connect social features and discussions to it to grow the communities around projects in a meaningful and healthy way. Collaborative work can reach from simple feedback to parts of whole projects that are implemented if accepted by the project owner. Also, creators can decide how much control they want to give to the community. They can make use of the voting, contribution and discussion system in any capacity they'd like to. Other fields like software development have long been evolving the concept of social coding. They bring the benefits of social networks and work focussed platforms together. Developers get to publish their work under Open Source licenses and open it for contributions. Other users can then share work too, discuss and share. What does it mean for Design, if this concept gets transfered? These features create communities. 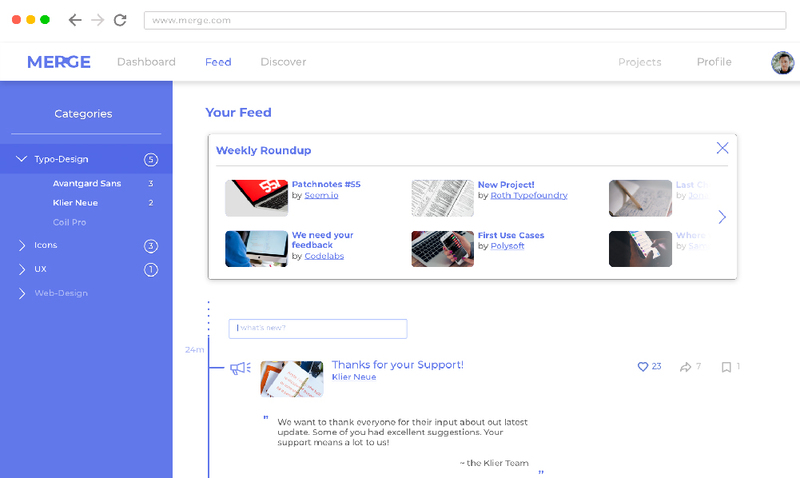 Not only do users contribute feedback and even actual content to be implemented, there's also automatically a large pool of user testers at the Designer's disposal. 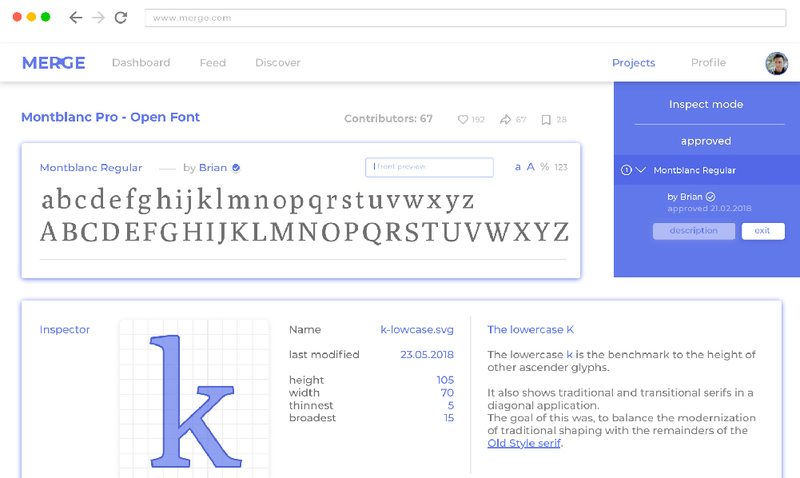 The Open Source availability of Design projects also provably increases the spread use of the material exponentially (evident through free to use imagery, fonts and icon sets online). ‍Social networking, tools for collaboration and the features around project management. Since they are tightly connected, users who got interested in the platform by browsing Open Source projects might take part in discussions too and eventually be inspired to create a project themselves. The site is visibly split up between social features and project/personal management tools. Everything based on community is aligned to the left in the nav bar. 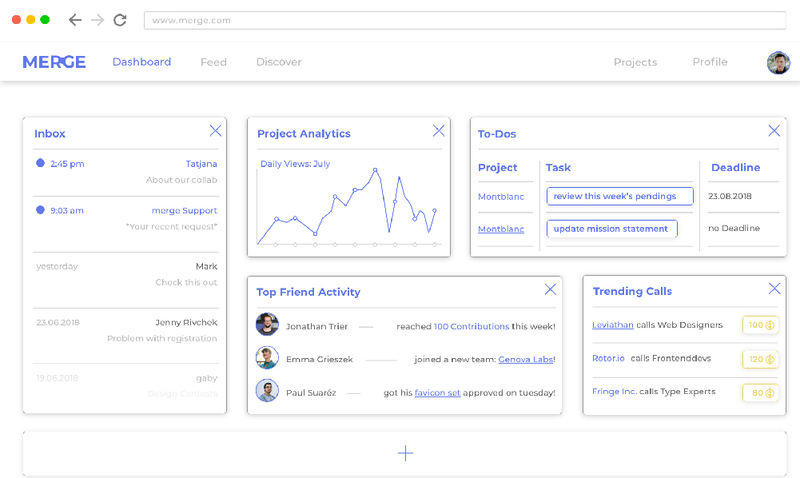 The Dashboard functions as the start screen and the widgets (like activity stats for projects, a message inbox or to-dos) can be configured by the user. 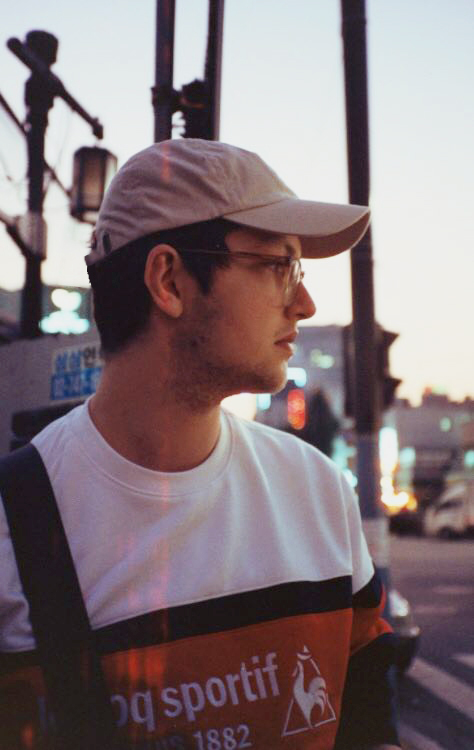 The Feed lets the user catch up on a timeline of his followed projects and creators. 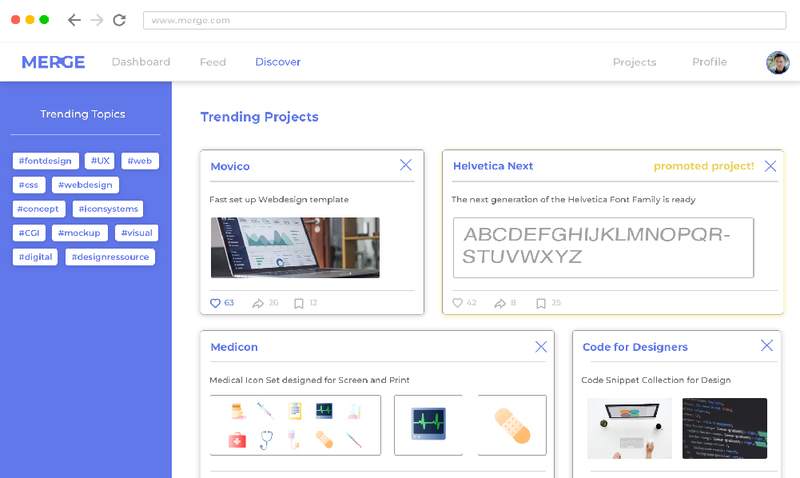 It shows their recent activity, achievements and announcements, while the Discover page displays new and also promoted projects the user might like. There's a variety of projects that would work with this platform. 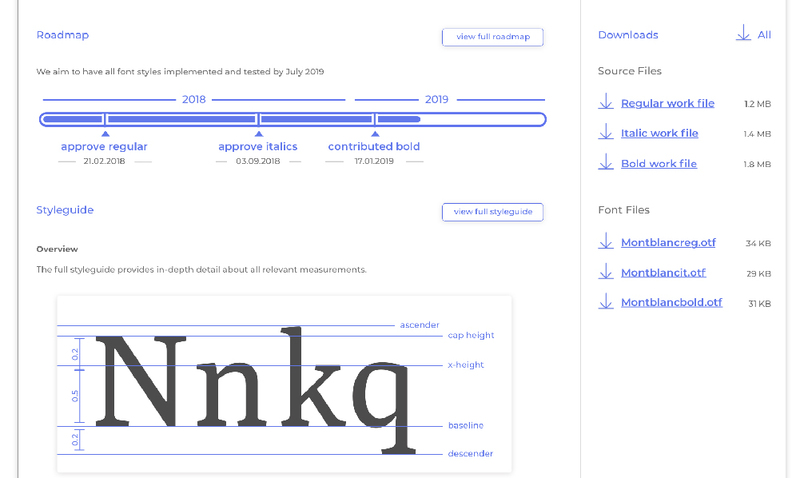 I touched on two examples in my thesis, an Icon set and a font. These projects can truly benefit from a lot of people contributing so the scope of the project can be much bigger then a small team could manage. 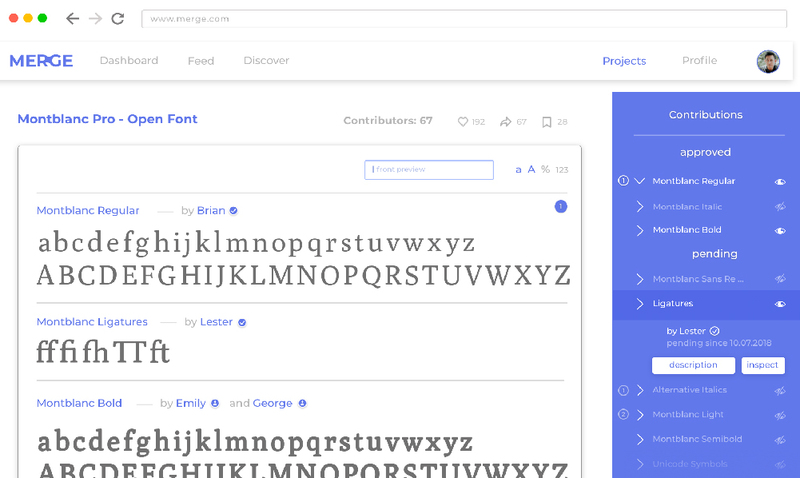 The Profile gives users the ability to pin the project they're most proud of to the top of the page. They can also show their recent activity on the site, as well as which teams they are members of or have been in the past. Of course they can also be contacted from this point by other users through personal links on the right. 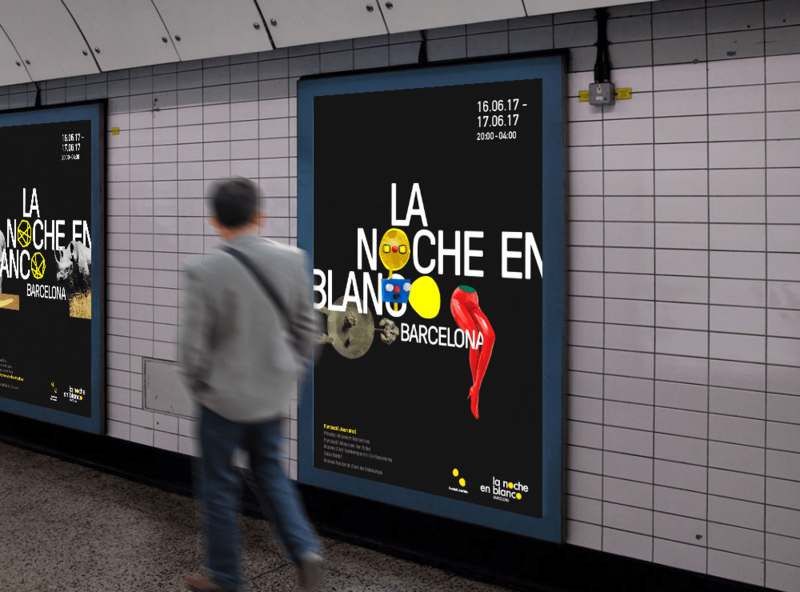 La Noche En Blanco is a program seeking to introduce a younger audience to the cultural wealth of six renowned museums in Barcelona. Each museum opens their doors to the public over the duration of two whole nights, creating a different perspective on the art pieces through a fresh presentation and live events. These special events are scheduled over the span of the event and visitors can use the brochure and the app to get informed. The main logo incorporates two moons into the event name, representing the two museum night dates. Each participating museum received a sublogo that represents the art works and architecture that can be seen at that individual place, while staying close to the main logo. 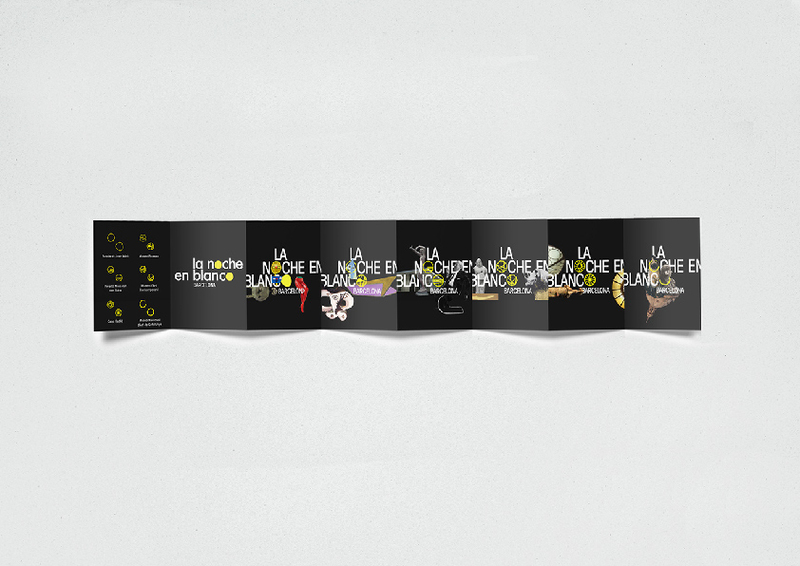 Each museum's event poster features a collage of museum artwork and the respective sublogo, as well as event data and links. 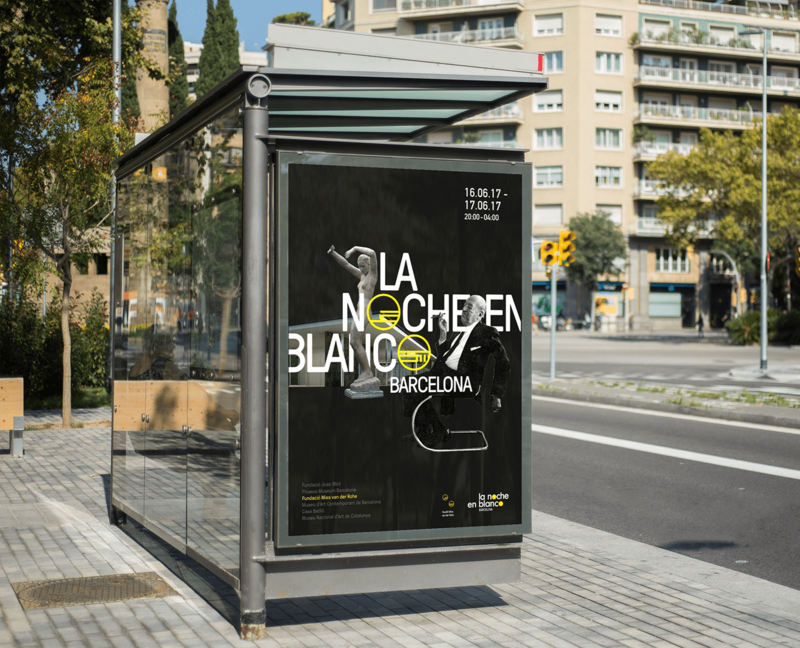 They are put up around the city to raise awareness for the event and to show how the museum nights are going to show the art in new contexts. 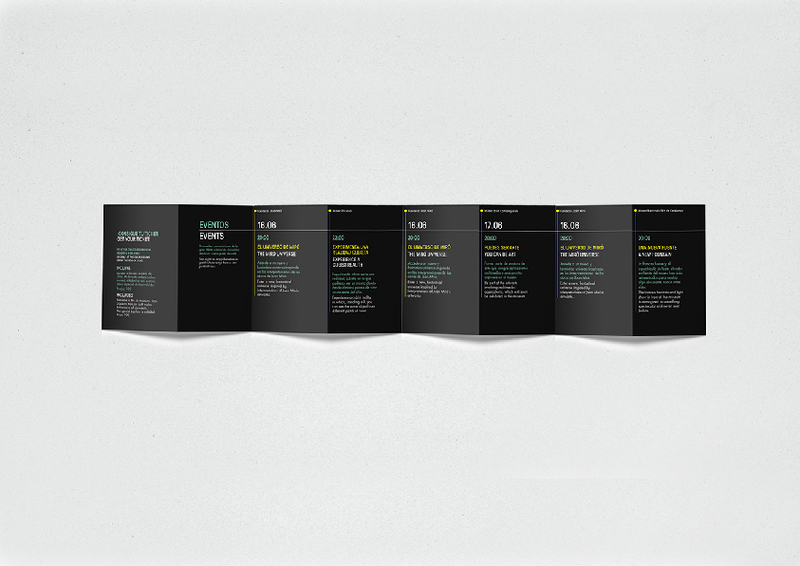 The brochure shows miniature versions of the posters as well as an event schedule. 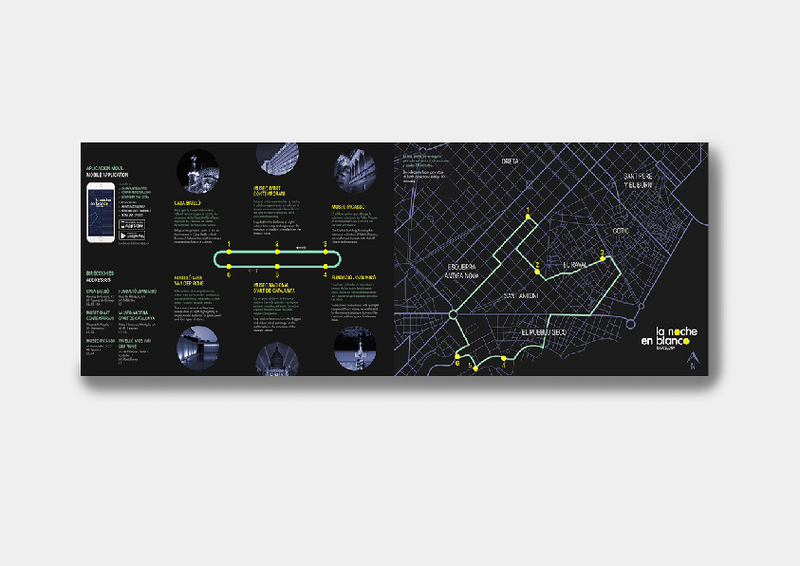 The backside includes a map of the city of Barcelona displaying the event locations and the bus route. 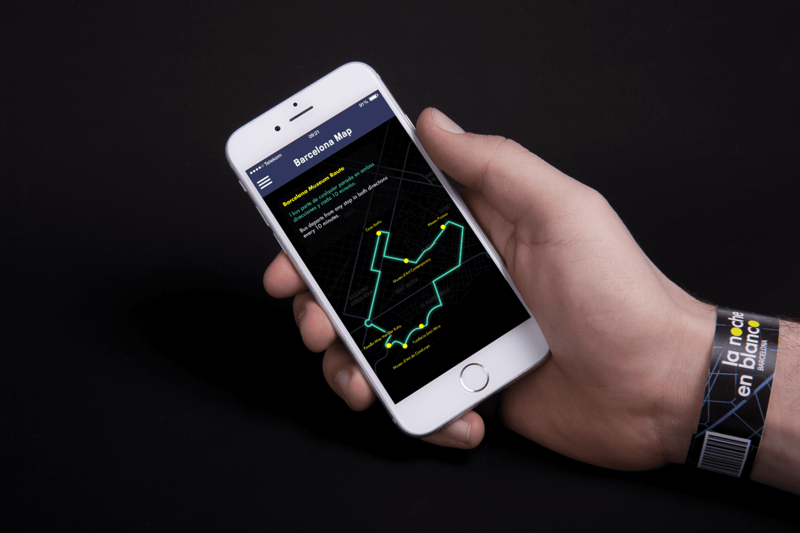 The event app serves as a companion throughout the duration of the two museum nights. 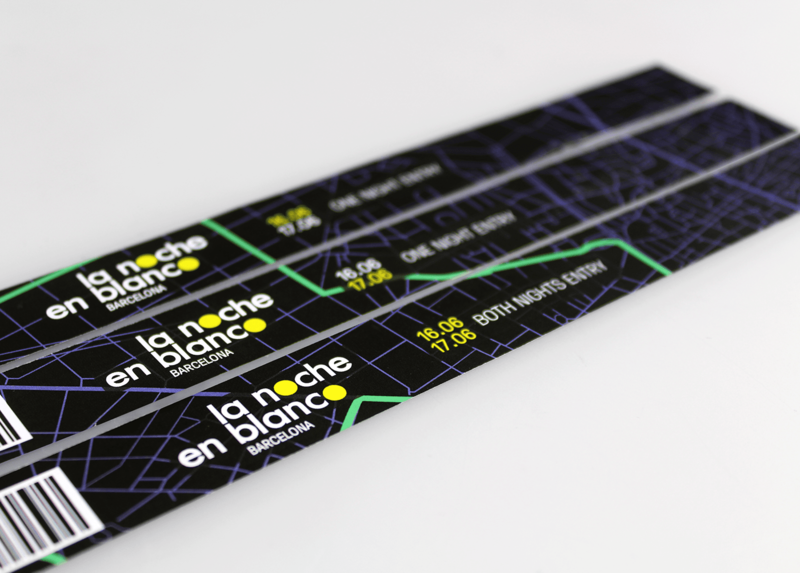 On top of showing the event program and offering a map like the brochure does, it also lets users plan their custom event schedule and get notifications about secret happenings popping up near them during La Noche En Blanco. The wristbands can be purchased for individual nights or the whole event span of two nights. They serve as admission tickets for the venues, as well as bus tickets. There's two one-entry-only variations for each respective night as well as an option for both nights. Each one is randomly cut out of the map layout to give it a more unique feel for the visitor. I've always had a passion for digital Illustration and it has influenced my Design work over the course of the last few years. After collecting personal projects for a while and doing commissions on the side, I decided to create a showcase of this work under the alias celeste. This portfolio of my Illustration and CG work can be visited over here. The celeste page shows a wide variety of mediums, such as posters, magazine Illustrations, album covers and Illustrations that were used for animation later on. I've tried to limit the work shown to a small number and to rather show a diversity in projects and styles. My Illustrations have been following a bright and bold coloring style for a while but I've started to experiment with different approaches recently. My favorite project to work on so far was the commission to create an album cover and two covers for singles of this album. 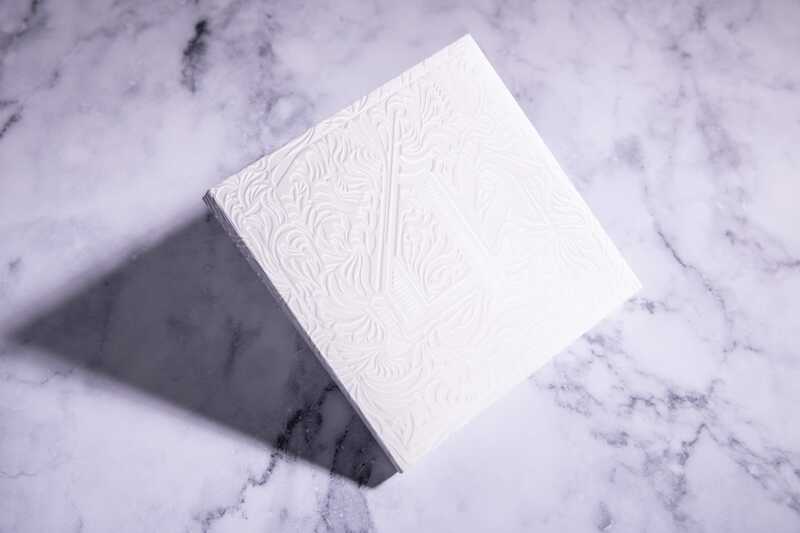 The French music label Record Record creates compilation albums of their artists' best work which is titled the » Filet Mignon « series. 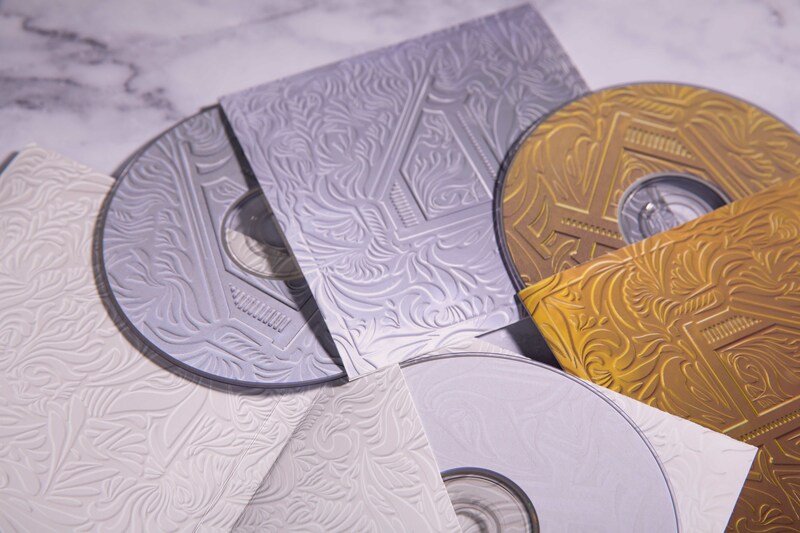 I used a mixture of Adobe Illustrator and Cinema 4D to create the reliefs of a » 4 « that represent the premium notion the title conveys. Below you can also see a few more of the projects from my portfolio. The brand Pinpongco is a personal project that had been an idea of mine for a long time and that I finally carried out mid 2018. 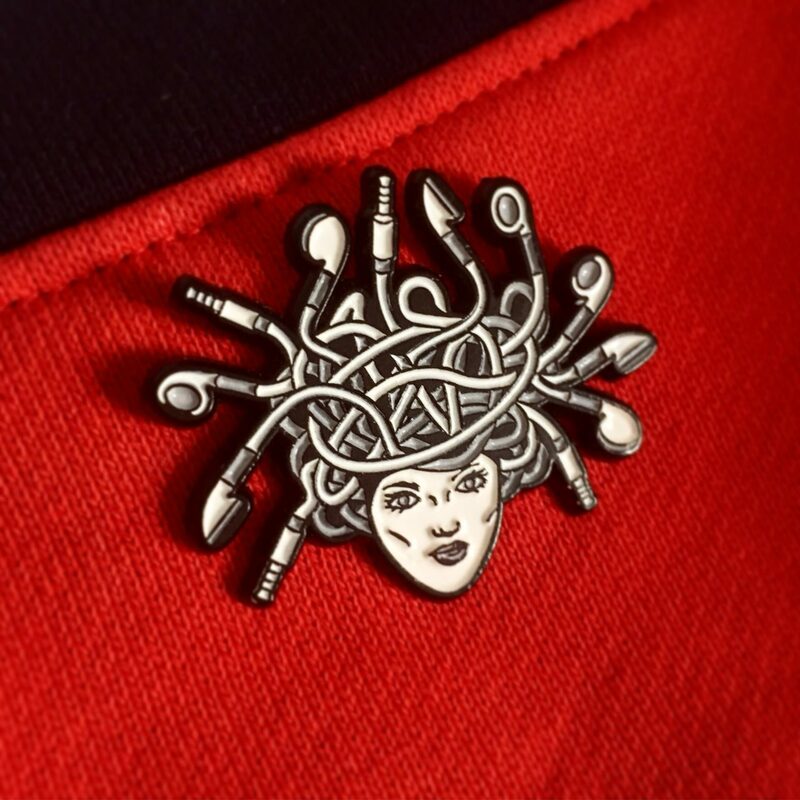 It's an online shop focussing on enamel pin designs that are mixing digital and pop culture with a twist. You see the shop over here! Creating an online shop from Branding over Design to Inventory and Social Media Management was a challenge that I found very interesting and was eager to take on. 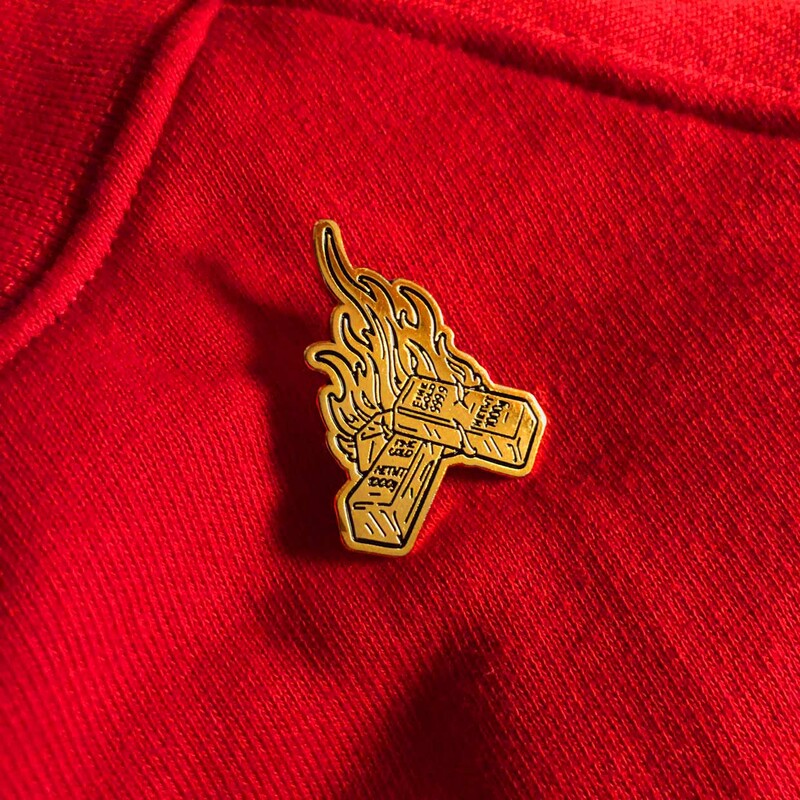 The pins are made from hard enamel and are produced in limited quantities between 100 and 200 pieces. 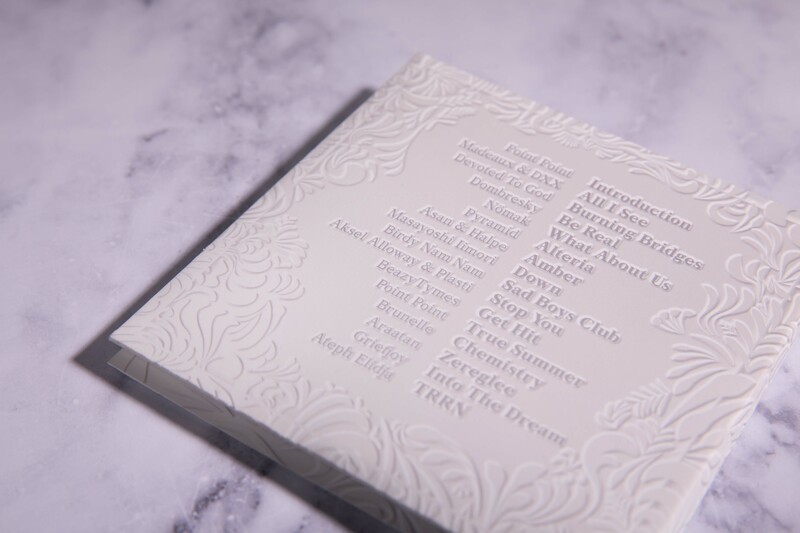 They ship on backing cards that are hand numbered with the piece's individual number and its respective run. They are sold on the online shop as well as Etsy and are promoted over Instagram. I also sell them in a few local shops for a commission of the sale price. Visual appearance of all products and communication is kept in a bright red. This is also being followed on the shop and on social media. 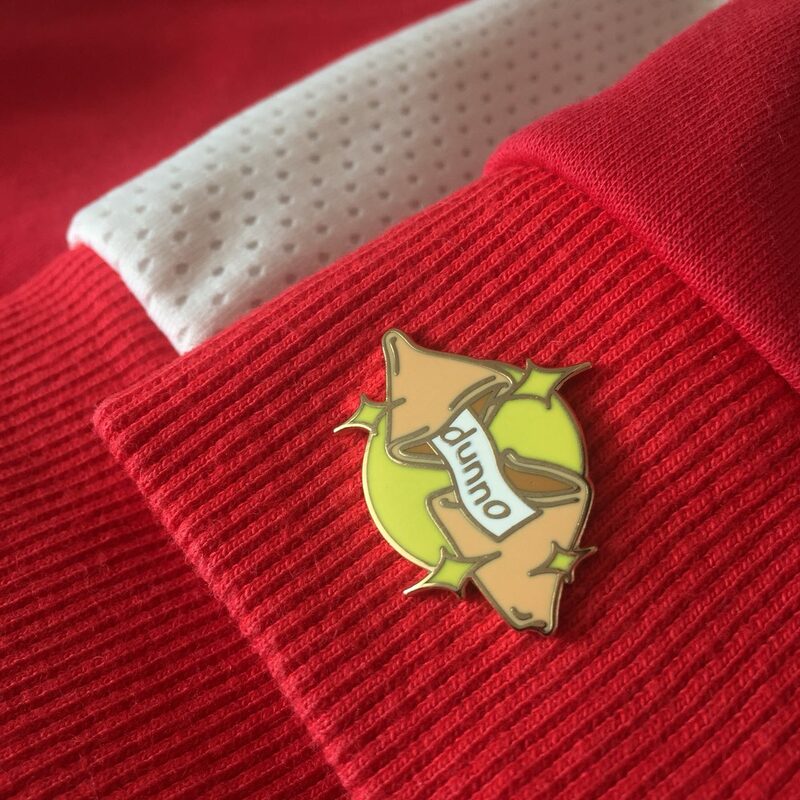 The reason for this is, that it keeps the pins in focus since they stick out, but creates attention for them at the same time. 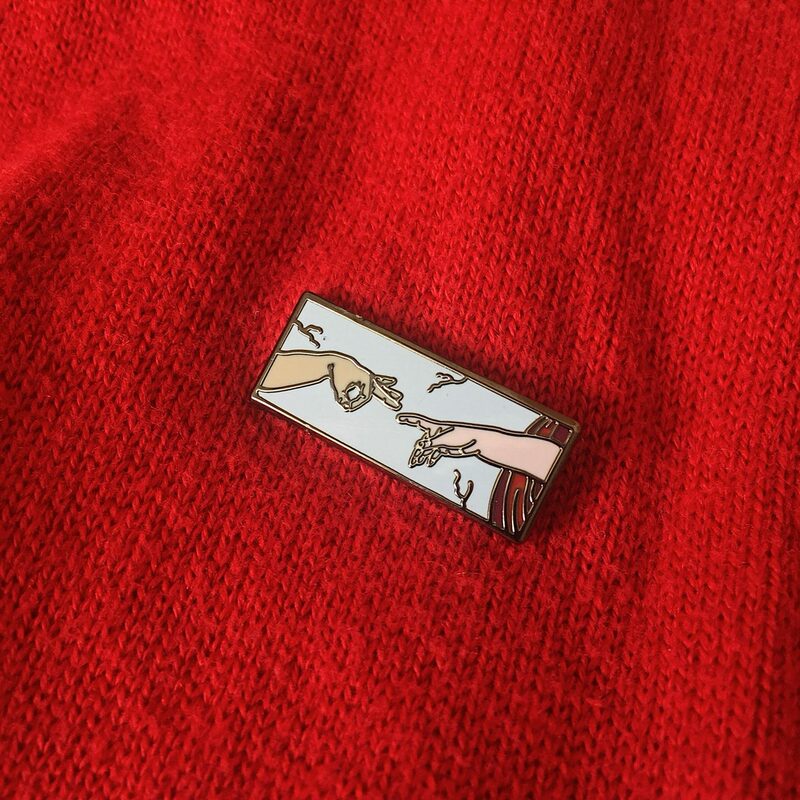 Occasionally this gets broken up though, to announce new pins or special collaborations. One example seen on the left is a special screen printed and oversized American Psycho inspired pin I created together with Chepooka from Singapore. With this project I really enjoy the complete freedom in branding, design and marketing, since it is all my responsibility. Right now it is just a fun passion project on the side but I'm curious to see what it might develop into in the future.